SOUTHAMPTON, England — Somewhere between the black Titanic teddy bears and the pale Iceberg beer, the Titanic Barbie doll and the "Tubtanic" bath plug, the global obsession with the story of the doomed ocean liner began to border on the absurd. A new museum opening April 10 in the English port city of Southampton has taken this into account, explaining how the world has reported, retold, and sometimes become utterly fixated on the fateful night in April 1912 that saw the White Star liner sink beneath the waves. "We're looking to tell a different part of the Titanic story," said city council member Mike Harris, speaking Tuesday at a preview event for Southampton's recently built SeaCity Museum. The museum had plenty of material to draw on. The ship is at the center of one of the world's best-known tales and one of the best-selling films in Hollywood history. Nearly 100 years to the day since it went down, claiming 1,514 lives, the demise of the reputedly unsinkable ship continues to fascinate, launching films, books, television mini-series and — here and elsewhere — museums. SeaCity's first temporary exhibit, "Titanic: The Legend," looks at how the circumstances of the ship's voyage has turned into a global obsession. A world map charts some of the 1,160 Titanic memorials spread across 34 countries, including India, Croatia and Russia. Screens broadcast clips from five different Titanic films, from James Cameron's global blockbuster "Titanic" to the 1912 silent film, "In Night and Ice," which appeared only weeks after the ship sank. The merchandise appeared almost as quickly. The exhibit carries examples of German plush toy maker Steiff's black "mourning bears," bought as a symbol of solidarity with the victims. Cheaper were the "in memoriam" postcards bearing pictures of the luxury cruiser. Recent years have seen the proliferation of more varied offerings — from jigsaw puzzles to video games and more. The Titanic brewery, founded in 1985 in the English town of Stoke-on-Trent, offers a range (or "fleet") of Titanic-themed ales, including "Steerage," ''Lifeboat" and "Capt. Smith's," an homage to the hometown hero who went down with the ship. Beer not to your taste? Use a "Gin and Titonic" mold to make ship- and iceberg-shaped ice cubes for your cocktails. The product's tag line: "Sink one in your drink." SeaCity — which scoured the Internet for many of its items — came up with a wide range of kitsch. The "Tubtanic" bath plug lets you splash along with a toy version of the ocean liner as you wash your hair. There are paperweights, in case you'd like the sinking ship to anchor your "In" tray. The Titanic-branded golf balls, one imagines, can help excuse a disastrous swing. Titanic memorabilia collector John Creamer put it best in his written introduction to one of the exhibits. "There's some weird stuff out there," he said. 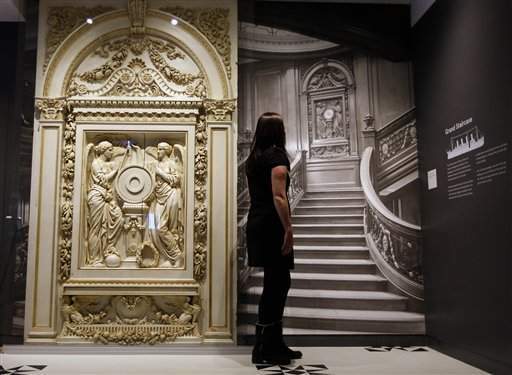 The Southampton museum — built on the site of a disused court building — is merely the latest in a string of Titanic offerings to coincide with the 100th anniversary of the doomed ship's voyage in April 1912. Last Saturday, Belfast opened its impressive 100-million pound ($160 million, €120 million) Titanic Belfast visitor center to celebrate the city where the ship was built.